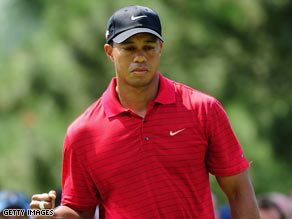 Tiger Woods claimed his 70th PGA Tour title with a four-shot victory in the WGC-Bridgestone Invitational in Akron, Ohio. Even by the world number one’s standards, this was a remarkable victory as he got the better of Ireland’s Padraig Harrington in a compelling last-round head to head. The turning point came on the par-five 16th where Harrington, leading by one, ended up making a triple bogey eight to a brilliant birdie by Woods. The four-shot swing all but insured Woods’ fifth victory of the year and he wrapped it up with a birdie on the 18th for a final round 65 and a 12-under total of 268. Harrington had withstood a front nine charge from Woods, who went out in five-under 30, but the Dubliner made a series of hashed shots on the 16th, culminating in hacking his fourth from the greenside rough into the water. It later emerged that the pair, who were watched by an enormous gallery, were given a warning for slow play and placed under the watch by match referee John Paramor. Harrington admitted he had felt rushed on the crucial hole, but Woods was more forthright in his opinions when asked by reporters about the incident. ‘I’m sorry that John got in the way of a great battle,’ because it was such a great battle for 16 holes,” Woods said. “And unfortunately, that happened.” Paramor, the chief referee for the European Tour, said that when they reached the 16th green, Woods and Harrington were 17 minutes behind schedule. “The 16th hole had opened up before they cleared the 15th green,” he said. “And therefore, we had no choice but to put them on the clock at that stage,” he added. Harrington, who had entered the final day with a three-shot lead over Woods, bravely parred the final hole to secure a tie for second with Australian Robert Allenby who moved through the pack on the final day with a 66. American Hunter Mahan also carded a 66 to tie for fourth with Masters champion Angel Cabrera on seven-under 273. British Open champion Stewart Cink also performed strongly in his first tournament since Turnberry to finish in a tie for sixth after four sub-par rounds. Woods, who was winning at Firestone Country Club for a record seventh time, finished the tournament with back to back 65s and will go into next week’s PGA Championship at Hazeltine as strong favorite, despite drawing blank in the first three majors of the season. It was also a timely return to form by Harrington, who defends his PGA Championship, but has performed poorly this year after a series of swing changes.